Lancôme has enhanced its premium Absolue anti-ageing skincare range with a new product and an innovative new formula. Editor Trudi Brewer lifts the lid on this luxurious update. Lancôme Absolue Soft Cream, $430 ($365 capsule refill). French brand Lancôme has updated its premium Absolue skincare range, adding a new product to the existing line-up to showcase an innovative new formula – which could just prove to be a game changer in this exclusive market. Here's what you need to know before you break out the credit card. The rebirth of the Absolue skincare range is being driven by the addition of Lancôme Absolue Soft Cream, which promises to regenerate and visibly transform the complexion in 28 days, proving that performance and luxury can go hand in hand. The cream can be used day and night and comes in a refillable gold jar, marking a more sustainable approach to packaging for the brand. Lancôme was one of the first cosmetic houses to create its very own rose to use in skincare. In the Soft Cream, this flower is combined with the Centifolia Rose and Rosa Damascena to create a complex of grand rose extracts that work together to regenerate, revitalise and illuminate the complexion. The addition of 12 nourishing oils – including passion fruit, meadowfoam, almond and apricot – ensures skin is left feeling super soft, as you'd expect from the name. Aside from the divine rose fragrance, (if you like this scent you will love this cream) the best and most innovative thing about this cream is the amazing texture. When it comes into contact with the skin, the cream liquifies to leave a thin but super nourishing veil of moisture on the skin that is easily massaged in. Once melted into the skin, the formula thickens up again to visibly plump up and transform your complexion from the inside out. Lancôme calls this its "thick-to-thin-to-thick formula" and really it's pure genius for a woman who wants an ultra hydrating, comforting cream going into winter this is perfect. 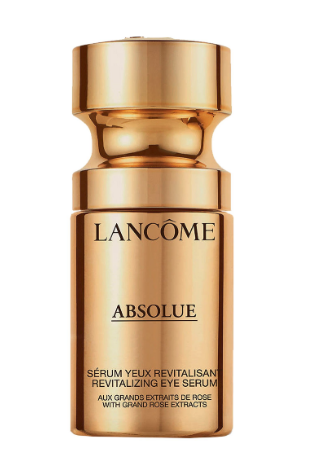 Lancôme Absolue Revitalizing Eye Serum, $226. This eye serum's silky texture is almost gel-like and instantly melts into the skin, leaving it feeling velvety soft, and refreshed. Its innovative formula works to smooth, illuminate and strengthen the skin in four key areas – above the brow bone, under the eye, upper cheekbone, and temples – created to enhance your best assets. It’s become part of our morning routine after cleanser and before moisturiser, thanks to the lightweight nourishment, and the wide-awake look it provides. Lancôme Absolue Revitalizing Eye Cream, $230. If the skin around your eyes is giving your age away, this could be the cream it needs. There is no right or wrong age to invest in an eye cream, but when you are looking exhausted this luxurious, rejuvenating eye cream with a potent combination of Grand Rose Extracts and Pro-Xylane could be just what the doctor ordered. Designed to hydrate and regenerate the skin around the eyes it visibly targets lines and wrinkles. We like to use this at night, pressed gently a tiny amount into the skin under the eye is ultra nourishing after a busy day. Thankfully a little of this luxe-y, worth every cent cream goes a long way.